Well first off it is good to see you again! On the wake on lan port forwarding may work, if your using a standard router and no firewall blocking certain packets then the type of packet shouldn't matter as all data is sent through the port thats are forwarded. But the question is does the router forward the ports when the computer is off? Normally wake on lan is done by the mac address. Its been such a long time since ive even used it! but this may be why you can do it locally but not over the internet. One side option for you, if it is possible, I have a computer here at home I use as my server, its on 24/7. If you have a similar computer that can stay on I could write a program for you that runs on the server, waits for a connection with a username and pass and then sends the magic packet locally to the other systems that need to be turned on. Not a perfect solution but it is an option. But if you only have the one computer and your looking to do it over the net yours options may be limited, a custom firmware may help, basically the router needs to send the packet to the nic card by its mac address as the card doesn't have an ip when it is off. Let me know what your next step is, I will help all I can. Thank you for the reply Shane! There have been several instances now where I wish I hadn't pitched the old dell we bought the kids in 95, relative to using it as a server. Also, thank you for offering to help. You had made that "general" offer in a CleanMem thread months ago, so you obviously are a great person. Trust I won't bother you with this! From a practical standpoint, I'd wanted to be able to access the desktop from my children's homes during visits should there be some one day software offer. I do use a work around, however. I have a little prog that can wake the pc up from hibernation or standby on schedule, then I log in remotely and re-hibernate it remotely. The Wake on WAN has become more of a challenge than a necessity! I ramble! Thank you again, ratchet! Not a problem, I'm here if you need me. has anyone any resolution to this issue? the problem is that WOL does it by mac address of the nic card and not ip. and using it over the net and even port forwarding do those by IP address and not mac. so WOL cant find the computer over the net. So far the only solution I have seen is where if you have another system running 24/7, like a server, you can install software that waits for the command to turn a system on the network with WOL. the program itself works over the net and then sends the WOL locally. So I have the program running on the server, then I have the client of the program on my laptop and use it to send the command over the net. Of course it has been a while since I have messed with WOL and things can change. But for now this is the only option I know of. You know that is one thing I never checked into. I wonder since they have battery backups that hookup via usb to let the software monitor the battery if they ever made one with networking in it for WOL? I think I might do a little research into that. I know they have some with timers so who knows. battery backup for sure to start with, no matter what. What motherboard do you currently have? So im curious to which board you have. I may have one other option. Remember when I said a program would be needed to be on the local network to turn the machine on? well with the right firmware and router the router itself can be the WOL program. And since you can enable the remote web interface for it you could login and turn the machine on. I didn't even think of this before. But this might be your answer. well at least getting a new router is an option and cheaper than a big battery backup. 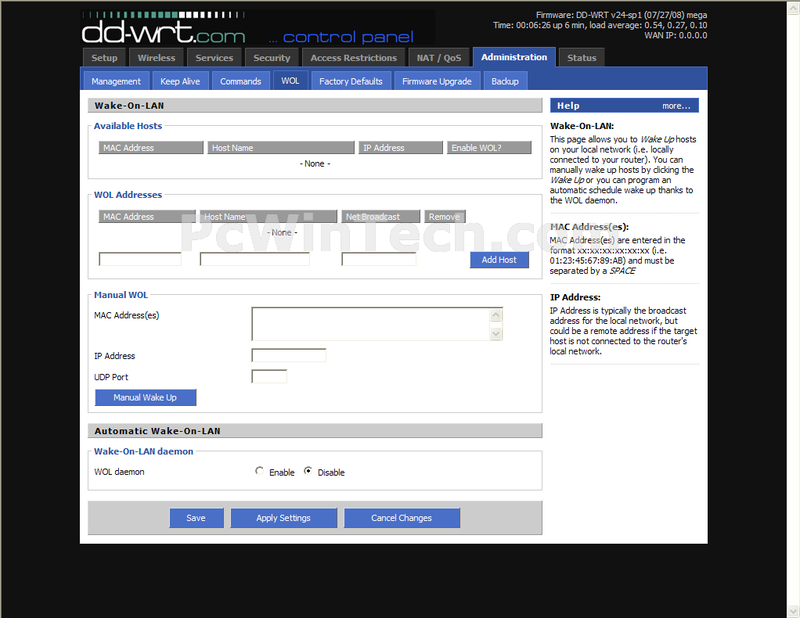 if you do go that route make sure the router is support by the dd wrt firmware. then your WOL over the net will be taken care of.